From left to right: Mr. Denis Stevens, Deputy Head of Mission, Embassy of Canada; H.E. Liberata Mulamula, Ambassador of Tanzania; H.E. Mohamed Tawfik, Ambassador of Egypt; H.E. 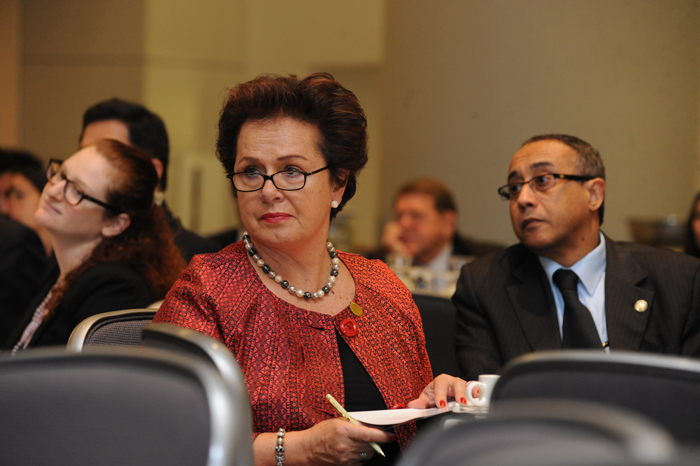 Ritva Koukku-Ronde, Ambassador of Finland, and Amb. 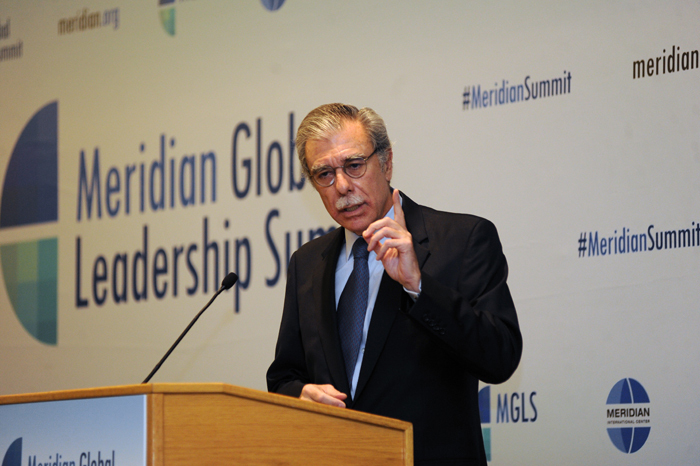 Stuart Holliday, President & CEO, Meridian International Center. 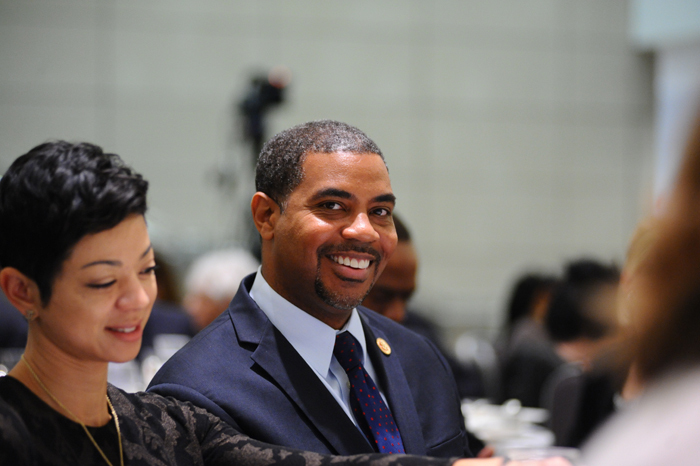 Photo by Joyce Boghosian. 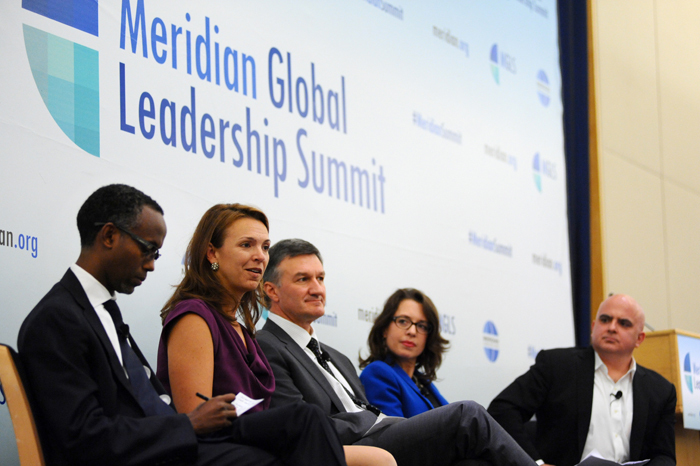 On October 17, 2014, Meridian International Center, hosted the third annual Global Leadership Summit in partnership with Gallup and the Ronald Reagan Building and International Trade Center. 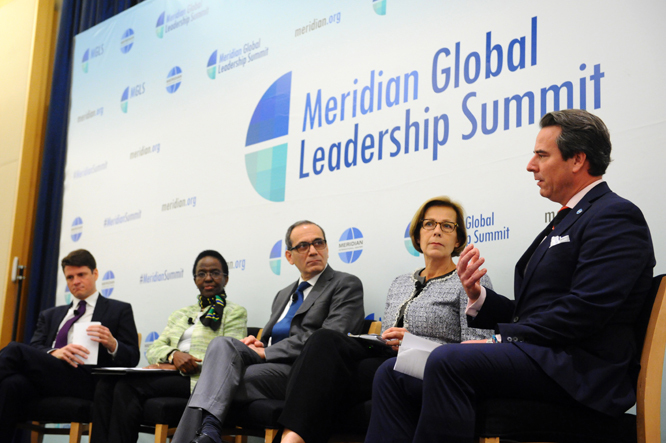 More than 200 influential business and world leaders, policy makers, subject matter experts, diplomats and members of the media gathered for a high level forum featuring stimulating and thought-provoking dialogue on the current and future state of global leadership. 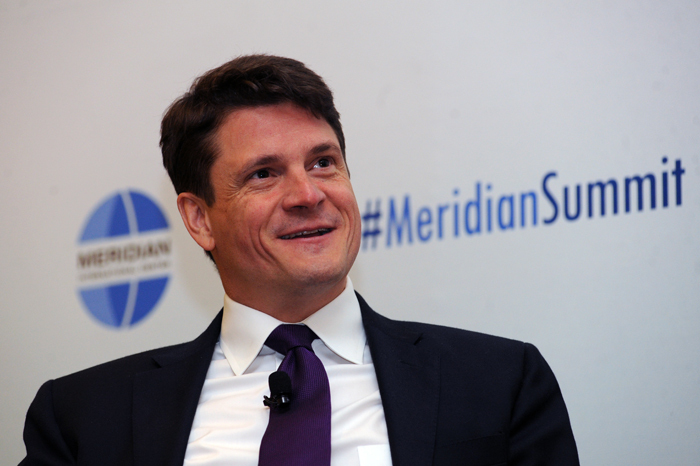 The Summit featured the release of “Global States of Mind: New Metrics for World Leaders” presented by Jon Clifton, Managing Director of Gallup World Poll. The report highlights key findings from Gallup surveys in 137 countries on how people all over the world are feeling, based on particular indicators. The report serves as an overview of the countries that scored the best--and the worst—on questions ranging from corruption to well-being. This data provided a foundation for a rich conversation to follow on “A View from Abroad.” Ambassador Holliday guided the globally-focused discussion with speakers H.E. Ritva Koukku-Ronde, Ambassador of Finland; H.E. Liberata Mulamula, Ambassador of Tanzania; H.E. Mohammed Tawfik, Ambassador of Egypt; and Denis Stevens, Deputy Head of Mission, Embassy of Canada. 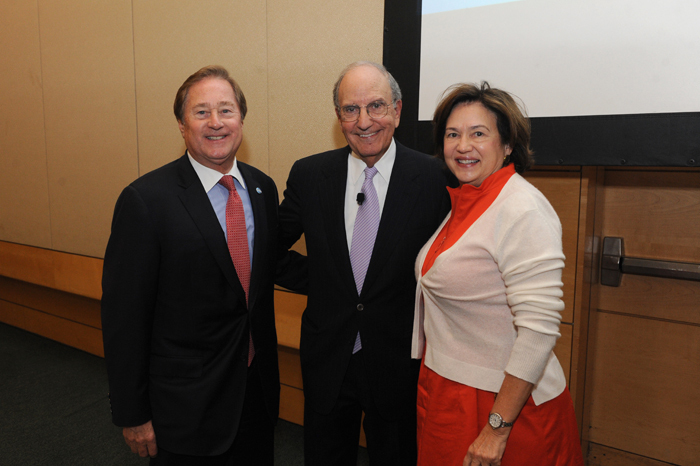 A Global Leadership Spotlight featured remarks by Senator George J. Mitchell, Partner and Chairman Emeritus, DLA Piper. Senator Mitchell’s inspiring tenure includes serving as U.S. Special Envoy for Middle East Peace, Senate majority leader, Independent Chairman of the Northern Ireland Peace Talks, and recipient of both the Presidential Medal of Freedom and United Nations Peace Prize. Over lunch, discussions around “Navigating Global Opportunities” reconvened, guided by entrepreneur and venture investor Christopher Schroeder. Mr. Schroeder was joined for the dynamic panel by Jennifer Ryan Crozier, Vice President of Global Citizenship Initiatives, IBM; Thomas Debass, Deputy Special Representative for Global Partnerships, U.S. Department of State; Kelly Keiderling, Principal Deputy Assistant Secretary, Bureau of Educational and Cultural Affairs, U.S. Department of State; and Al Monaco, President and Chief Executive Officer, Enbridge, Inc.
Current threats of ISIS and territorial aggression were the focus of a conversation between foreign policy icons, Ambassador Tom Korologos, Strategic Advisor, DLA Piper.